All over the world, there were 65,6 Million people forcibly displaced and over 22,5 Million Refugees. For anyone arriving into a new society there are both individual, humanitarian and societal gains to make newly arrived feel more included, so the inclusion of refugees is very important. Here is a video (transcript below) in which Henrik Rudberg of Sonician is interviewed by representatives from the city of Gothenburg about the Integra-system that Sonician built on top of Otto for the city. Gothenburg itself is a city in which more than 25% are not born there, and 1 in 10 has arrived as a refugee. CM: You and your colleague have been here today to present the new computer system for “Refugee Guide/Language Friend”. Can you tell us a little bit more about that and present yourself? 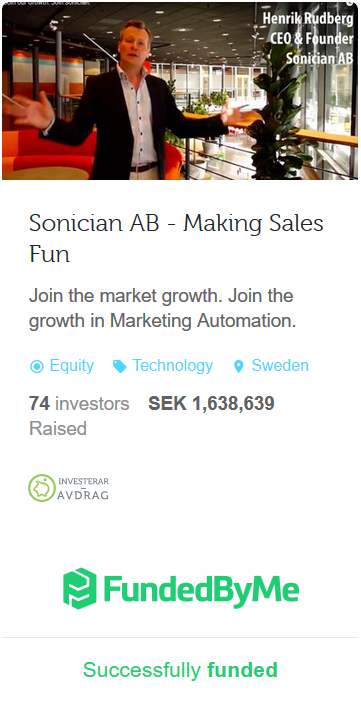 HR: Yes, thanks, my name is Henrik Rudberg, from Sonician. This computer system, we call it Integra, we have a demo up at integra.zone (sorry, Swedish only), so almost like integration, but in Italian, in that case. We developed it together with the Center for Integration at the City of Gothenburg. To make it easier to match people, where we can imagine more established Swedes and newly arrived, so we can facilitate a meeting in what in Gothenburg, it’s called Language Friend/Refugee Guide, and in other places perhaps have different names. HR: Yes, exactly. When you’ve been working with something like this for 14 years like Lahdo Bulun and the others, then you have a lot of experience how this should work in the best possible way. and that it’s important to do something more fun, and that it’s important for a good meeting with an exchange at many different levels rather than having to spend time on administrative question on where, when and how to meet etcetera. CM: So now, all of us at the Center of Integration are very happy, and we hope everything will work even smoother with this new computer system, and above all, faster, because we’ve had so many applicants who’ve applied to become Language Guides for the last year. It shows a great engagement level from many in the Swedish society. But they’ve had to wait for some time as we haven’t been able to keep up doing these matches. But now it’s going to be much easier, right? HR: Yes, that’s absolutely the objective to considerably shorten the time to perform a matching. Both to shorten the time from application to actually having entered the matching process and to get a matching proposal directly. Furthermore, it will be so much easier to see where there are groups or where there are groups missing of established or newly arrived, which will also make it easier to see where more marketing may be needed to reach out to those who are lacking. CM: And who knows, there may be others around the country because as Lahdo Bulun said before, there are similar activities in very many of the municipalities around Sweden, now. Perhaps they’ll also be able to enjoy this system now, or? HR: Yes, just during this conference today, we’ve been able to talk to a number of them and the interest have been very high. Obviously, we’d very much enjoy if others will start to use it. In the end, it’s a societal issue, to make sure that as many as possible will have inclusive and joint meetings all over. It’s clear that integration and inclusion of newly arrived and refugees will be so much faster and as Hans Abrahamsson said here earlier, it’s not as much to stop an exclusion, but also to tear down the walls around the inclusion because I think there are very many – and unfortunately as we’ve heard it may be an innate part of too many – native Swedes to be a bit reserved. So making sure that more will be meeting with others. I think it’s very beneficial for all parties. CM: I hope so, too. Thank you so much.